With the Wilton 3-Pc. 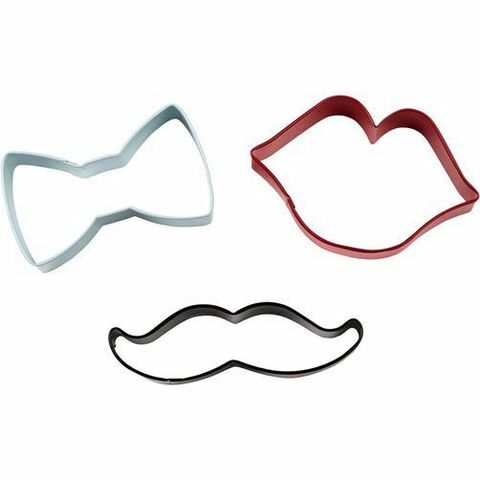 Colored Metal Cookie Cutter Set, you can make perfectly shaped bow tie, mustache and lips cookies every time. Whether you make these roll-out cookies for gift giving or serve them at your next party, everyone will love these deliciously decorated roll-out cookies. 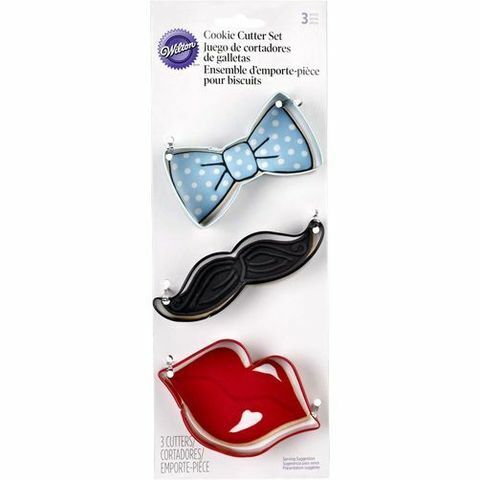 The sturdy and colorful coated-metal set of three cookie cutters makes it easy to get perfectly shaped cookies every time. You can even turn these into cookie pops to use as photo-booth props with cookie treat sticks. Package includes recipe for roll-out cookies. Hand wash and dry thoroughly. With the Wilton 3-Pc. Colored Metal Cookie Cutter Set, you can make perfectly shaped bow tie, mustache and lips cookies every time. Sturdy metal cutters retain their shape, meaning you'll have great results from these cutters year after year.Package includes recipe for delicious roll-out cookies. Add a cookie treat stick to these cookies to make cookie pops for photo-booth props. Before first and after each use, hand wash in warm, soapy water; rinse and dry thoroughly with soft cloth.